A new, 9,000-seat waterfront concert venue will debut this spring at San Francisco’s home for the America’s Cup, on Piers 27-29, officials with Live Nation announced Tuesday. Among the acts booked at the facility is Sting, who will perform there June 2. Construction of the temporary outdoor concert facility is set to begin in the spring, officials said. It will host concerts, comedy, family shows, America’s Cup-related events and other entertainment from late spring into early fall, coinciding with the race activities. What happens to the concert venue following the close of the America’s Cup activities was not clear on Tuesday morning. 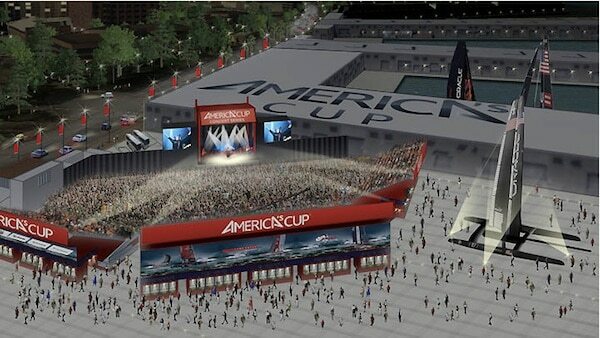 The America’s Cup Pavilion is being billed as San Francisco’s first Waterfront Music Venue. Live Nation officials on Tuesday said Sting will mark the first concert at America’s Cup Pavilion when he performs there on June 2. It will be roughly the same size as Berkeley’s Greek Theatre, which is operated by rival concert promoter Another Planet Entertainment. Two other similar outdoor concert facilities, Mountain View’s Shoreline Amphitheatre and Concord’s Sleep Train Pavilion, are larger — holding 22,000 and 12,500 seats, respectively — and are operated by Live Nation. Sting, slated for a June 2 performance, is the first announced act in the America’s Cup Concert Series. Tickets for the show go on sale Feb. 22 via Ticketmaster. Live Nation officials said more shows will be booked at the venue and will be announced as details for the concert series are finalized in conjunction with other America’s Cup events. The concert series will run through October, officials said. The shows will be copresented by the America’s Cup and Live Nation. “An outdoor venue in the city of San Francisco is long overdue,” added Jodi Goodman, president of Live Nation Northern California. Still, the venue is labeled as “temporary,” with events running through October, coinciding with Louis Vuitton Cup (the America’s Cup Challenger Series), the Red Bull Youth America’s Cup and the America’s Cup Finals.